"faster design of modular equipment and components"
"reuse of knowledge regarding both products, services and processes"
The European manufacturing industry faces new challenges, which are currently not addressed by today’s products and systems. Most of the products are still in essence ‘simple’ in nature, with no capability for adapting to the consumers’ needs and no integrated methods exist for the holistic acquisition and processing of feedback information emanating from product-services. ICP4Life proposes an integrated, collaborative platform for the design, development and support of productservice systems for SMEs (99% of companies in Europe), equipment manufacturers and energy suppliers in order to maximize the impact in the European industry. The proposed platform comprises of three main components. 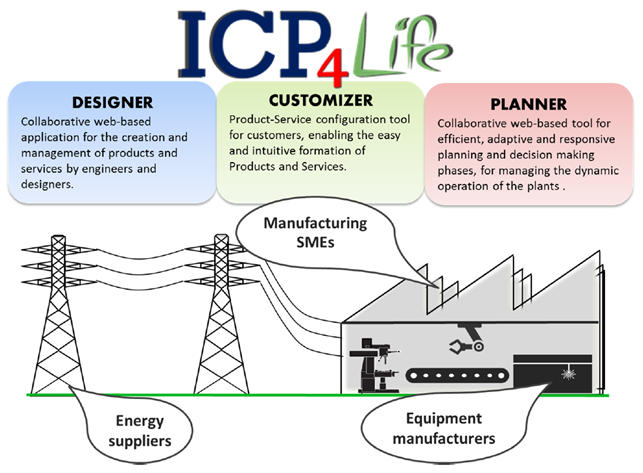 The first component (ICP4Life Designer) demonstrates a collaborative web-based application for the creation and management of products and services by engineers and designers of multiple disciplines. The second component (ICP4Life Customizer) is a Product-Service configuration tool for customers, enabling the easy and intuitive formation of Products and Services. The same component will be used for managing product related data pertaining to the manufacturer, supplier and the customer. The third component (ICP4Life Planner) will support the efficient, adaptive and responsive planning and decision making phases, for managing the dynamic operation of the plants and the supply chain. All the components will be compatible with open standards, such as AutomationML, in order to make the most out of and accelerate the adoption by the European industry. The ICP4Life project will address the current needs of today’s manufacturers, providing faster design of modular equipment and components, the seamless collaboration of engineers across a wider network of companies as well as within a single company with disperse engineering offices and production sites and the reuse of knowledge regarding both products, services and processes for new projects or the configuration of existing lines. Finally, an opportunity arises through the use of three different components covering the whole lifecycle of a product, to measure and control the entire environmental impact of a product, through relevant services. The ICP4Life consortium consists of highly skilled organizations to ensure the success of this project including key end users such as Manufacturing SMEs and two big companies belonging to the manufacturing equipment and energy supply industries, having over 26.300 employees in total. 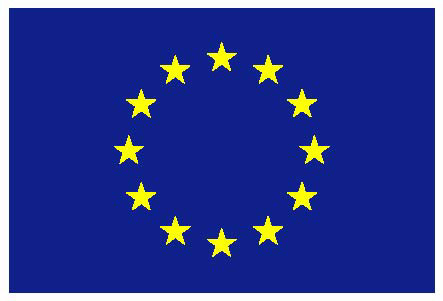 The ICP4Life project is funded by the European Union. © 2014-2019 by the ICP4Life consortium. All rights reserved.